I let him choose which colors he wanted to use and let him drop them into the mixture. I originally planned to make seperate batches of red, blue, yellow and green, but he said he wanted to mix all the colors together, so that is what we did. It turned out to be really cool, because the colors just swirled together without really mixing up for a while. He was very excited about the outcome of the decision he made to mix the colors together and so was I! Eventually the goop did turn brown. My little guy played with it for a while and then decided it looked like quick sand. Soooo...he ran as quickly as he could into his room and grabbed his octonauts. He played with them in the "quicksand" sinking them and rescuing them. They actually did sink in the goop. He had so much fun with this and he thought of it all on his own! And, because we can't do any kind of activity without incorporating trucks, we took the goop outside to make a construction site. The goop was starting to harden up a little by this time, but I decided it would be fine for the construction site. We just poured the goop out on the table, but you could use a baking sheet for easier cleanup (the goop cleans up easily with a damp cloth). He had a blast digging, dumping and pushing the goop around with his trucks. 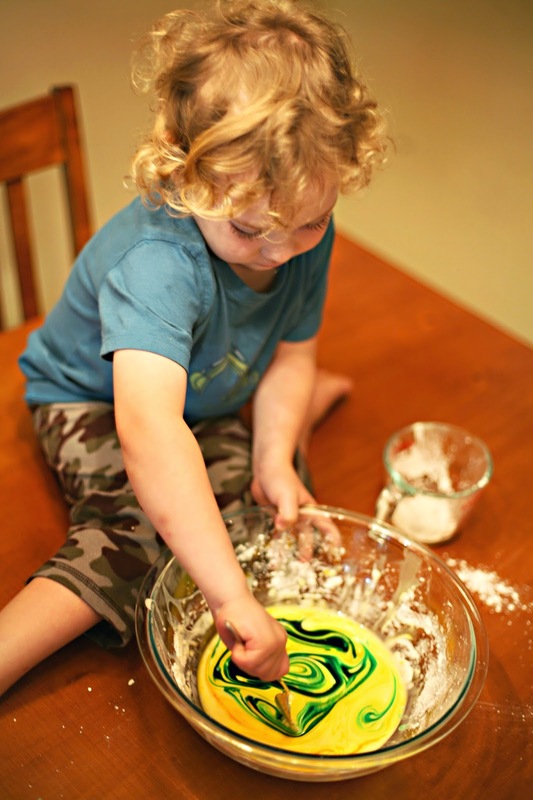 These activities are perfect for practicing fine motor skills and helps them learn cause and effect by moving and manipulating the goop around. Plus it's just plain fun! What fun your son had! 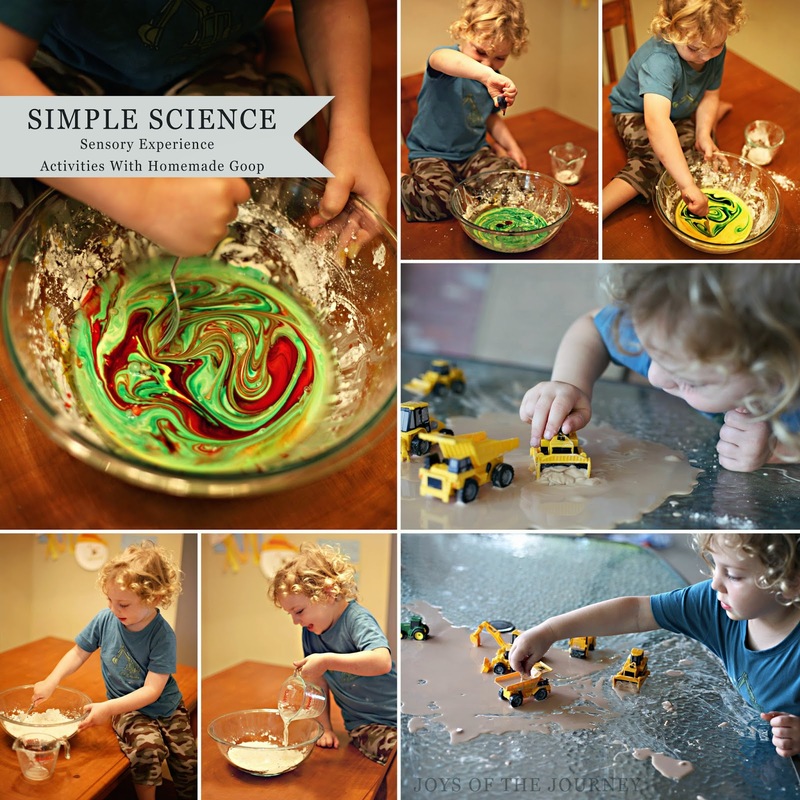 My son hasn't been fond in goop in the past, but maybe if I involve him in the mixing process, like you did and brought out some trucks he would enjoy it more! Thanks for linking up with the Hands-On Play Party! It has taken time for my little guy to put his hands in and get messy, too, but as soon as we got the trucks and octonauts out he was more open to it. I put a bowl of clean water by him so he could dip his hands in when he wanted to. The great thing with this goop is it washes right off! My daughter loves this stuff too! I love how you really let him go at it, even on top of the table! He looks like he's having a blast! Haha!! No matter how hard I try to keep him in a chair, he always ends up on the table!! He did have alot of fun with this! Thanks for looking!! 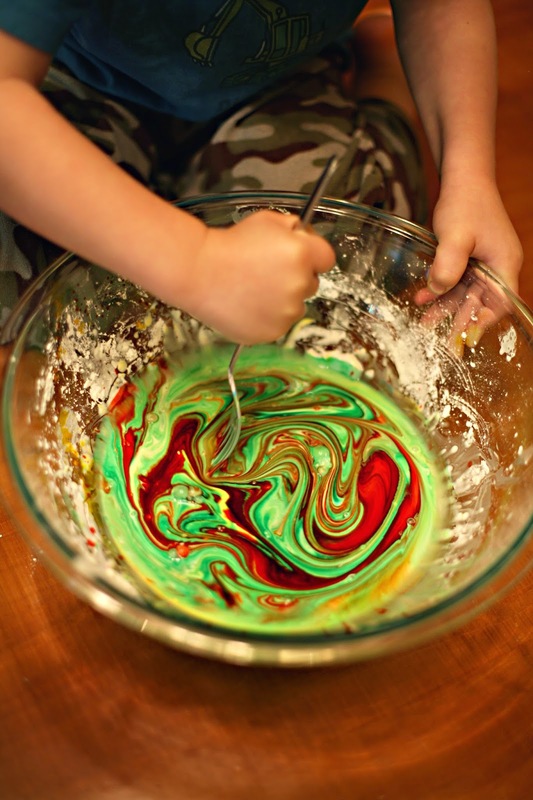 This goop activity never gets old! I like the color twist to it. Thanks for sharing in my STEM Tuesday! We love it and you can do a lot with it! Thanks for looking! Follow by Email to receive the latest posts of what we have been up to! Joys of the Journey. 2014 All Rights Reserved You may not take images or content from this site. Simple theme. Powered by Blogger.